President Muhammadu Buhari Tuesday urged the people and government of Burundi to explore dialogue in resolving the current political differences in the country. 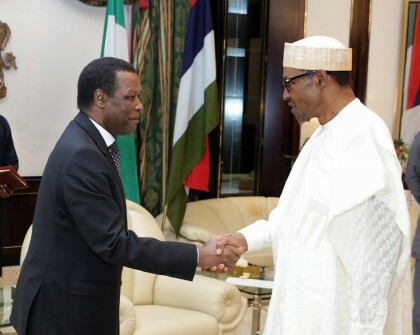 Receiving the former Burundian President, Mr. Pierre Buyoya, at the State House, President Buhari said Nigeria would continue to support peace processes in the continent through the African Union (AU), which had already intervened in Burundi. ‘‘Nigeria has been playing a key role in the continent through the AU. We participated fully in ensuring a truce in Mali, and we want citizens to enjoy the impact of the truce, although the terrorists are not helping matters. ‘‘Nigeria is always committed to regional and continental peace, and we will continue to do our best’’ he said. The President told the former President of Burundi, who is the High Representative of the AU Mission to Mali and the Sahel, that he remained hopeful that there would be an amicable solution to the situation in Burundi. In his remarks, the former President commended Nigeria for the role it played in restoring peace to Mali, adding that the AU was working to promote security in the Sahel, particularly through fighting trans-border terrorism.